The North Carolina Fraser Fir & A Perfect Giveaway! On a mountain somewhere in western North Carolina stands a tree. This tree is surrounded by others and like humans, some are a little taller, some a bit shorter, some a litter fatter and others a bit slimmer – but all have the same fragrant, blue-green needles and natural pyramid shape. This tree began it’s life about 12 years ago as a seedling and at the ripe age of 4 was transplanted along with its kindred on the side of the mountain. During the eight years (more or less) there, it has enjoyed beautiful vistas of the Blue Ridge Mountains, winter snows, spring rains, cool summer days and nights, and fall colors which would, if it were human, have taken its breath away. Nearly 100 times each year, its owner has visited, inspected, and lovingly groomed it. And once a year, a swarm of ladybugs was released on it to eat the aphids which love to feast on it’s beauty and thus destroy it. Now, at approximately twelve years old, the tree stands 8 feet tall (it’s kindred at this age are anywhere from 6 to 10 feet tall). The tree stands proud, sturdy and tall…and ready, at last, to fulfill its purpose for which it was planted 12 years ago. Yes, it is the year, that special year, when it will be chosen from among all the other trees by a family who will cut it and take it to its final home. Some of it’s kindred will be cut by the farmer who owns them to be sent down the mountain to places near and far where their beauty will be displayed in a Christmas tree lot, there to wait patiently for a home. Once chosen, the tree will be adorned with glorious lights and decorations. Families and friends will gather ‘round it, beautifully wrapped gifts will be placed under it and there, in its final resting place, it will make glad the hearts of children and adults alike. This tree, America’s favorite Christmas tree and the state tree of North Carolina, is the Fraser Fir. Choose & Cut – Ashe County. Poles are used to measure the trees which are sold by the foot. Folks waiting in line to pick up their Frasers. Ashe County Choose & Cut. Our grandson has picked out his own Fraser fir. He loves Frasers too! My husband, grandson and me surrounded by Fraser firs. Baled and stacked. Ready for the trip down the mountain! Loaded! Next stop is a Christmas tree lot near you! Usually no more than 600 to 800 trees can be loaded on a full-size tractor trailer. Fraser firs headed down the mountain. “Fraser, John (1750 – 26 April 1811) was born in Tomnacross near Kiltarlity, Inverness-shire, Scotland, the son of Donald Fraser, a farmer and grounds officer of the Jacobite leader Simon Fraser, thirteenth* Lord Lovat. John Fraser’s mother was probably one Mary McLean of Cragganmore, Inverness-shire. Nothing is known of his childhood and education. In the 1770s, Fraser moved to London and established himself as a draper and hosier in Paradise Row, Chelsea, where he married Francis Shaw in 1778. The Frasers had two sons, John (baptized 1780), who accompanied his father on two collecting trips to North America, and James Thomas (baptized 1782), who helped manage the family’s botanical nursery in England in the 1800s….”. Abies frasieri (Fraser Fir), named for John Fraser, is native to the southeastern Appalachian Mountains. John Fraser discovered the Fraser fir while on a foraging expedition in North Carolina with the French botanist, André Michaux, in 1787. The story has it that after being together for so long, Michaux tired of Fraser’s incessant talking. When Michaux’s horse wandered off one night, he encouraged Fraser to continue on without him while he looked for the horse – an excuse to get away from Fraser (or to get Fraser away from him). That was Michaux’s biggest mistake because it was while John Fraser was foraging on his own that he discovered the fir, Abies fraseri (or Fraser fir). It makes sense to me that America’s favorite Christmas tree was discovered in North Carolina, the home of Fraser’s Ridge, by a Fraser. 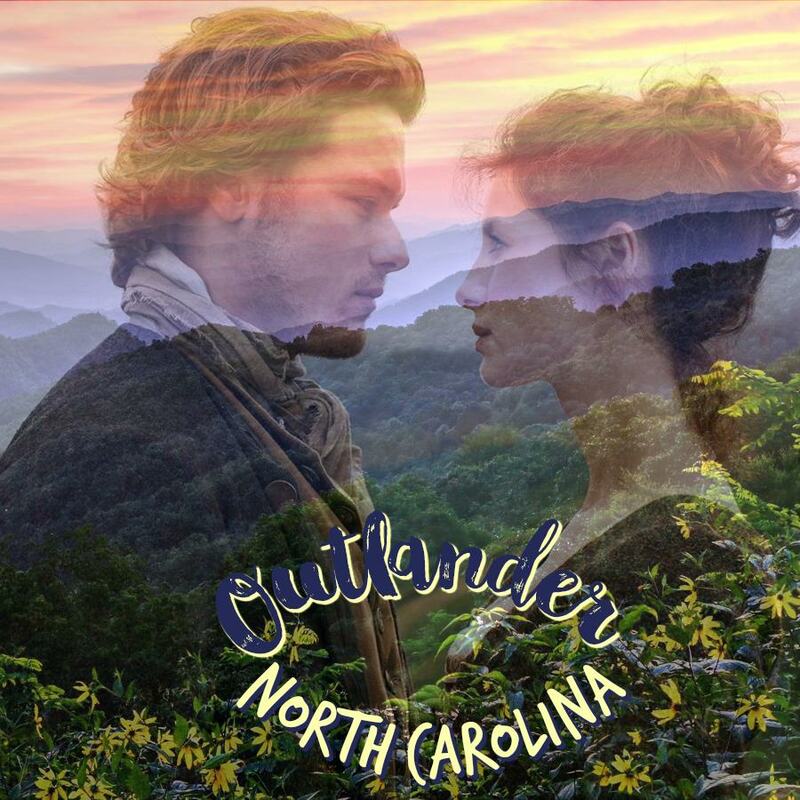 The tree that stands on the mountainside, proud, tall and strong, bringing beauty, love and joy to so many, could only be a Fraser! So, this Christmas, as you stand around your own Fraser fir singing Christmas carols, sipping eggnog or wassail, opening gifts, telling stories of Christmases past or just simply enjoying the beauty of this most wondrous tree, remember the name it carries is the same name that holds a special place in the heart of all Outlander fans – Fraser! Je Suis Prest! It is ready! Merry Christmas to you all!!! My Fraser – Before Picture! My Fraser – After Picture. Our Elf, Max, is hanging out at the top! He likes Frasers too! Well, who doesn’t?!?! The Fraser fir is native to North Carolina and only grows naturally in the Southern Appalachians. The Fraser fir can be successfully grown on land elevations exceeding 3000 feet above sea level making the mountains of North Carolina a perfect location. On average, it takes 7 to 10 years in the field to produce a 6-7 foot Fraser fir Christmas tree. The Fraser fir can reach a maximum height of 80 feet. Over 50 million Fraser firs are grown in North Carolina on 25,000 acres for use as Christmas trees, and the Fraser fir represents over 90% of all the trees grown in North Carolina as Christmas trees. The North Carolina Fraser fir Christmas tree is the most popular Christmas tree in North America and is shipped into every state in the U.S. as well as the Caribbean Islands, Mexico, Canada, Bermuda, Japan and other points all over the world. Ashe County, North Carolina, is the largest Christmas tree producing county in the United States, with over 12,000 acres in production resulting in over 25 million trees. Christmas trees in Ashe County provide enough daily oxygen for 216,000 people. Cut trees are harvested in 3-6 weeks starting the first week of November. Trees are cut, carried from the field, baled by machine, hauled to a loading yard or storage area, and sorted by size. In 2017, the high demand for Choose and Cut Fraser firs exceeded the supply in Ashe County alone with many farms having to close earlier than anticipated. In honor of the Fraser fir, I am giving away a new paperback edition of Gloria Houston’s “The Perfect Christmas Tree: An Appalachian Story.” Gloria Houston was a teacher and a native of the Appalachian Mountains of North Carolina and lived in Asheville, North Carolina. The Perfect Christmas Tree: An Appalachian Story. 1918: the Christmas Ruthie has longed for all her life and the Christmas she will never forget. This is the year Ruthie’s family has the honor of giving Pine Grove its tree. Last spring before he left for the war, Papa chose the prefect balsam tree from high on a rocky crag. But now, as Christmas draws near, Ruthie and Mama wait impatiently for the Appalachian mountain train to bring Papa home. Even with news of the Armistice there’s no word from Papa. Soon it’s Christmas Eve, and Ruthie and Mama can think only of seeing Papa again. But despite that, Papa promised the townsfolk a tree, and now–with Papa or without him–Mama will see that his word is kept. Gloria McLendon Houston’s story of the courage and power of a family is as joyful and timeless as Christmas itself. And exquisite, jewel-like paintings by two-time Caldecott Medal recipient Barbara Cooney capture all the story’s warmth and mountain flavor. To enter for a chance to win, you must have or register for an Amazon account; however, NO PURCHASE IS REQUIRED. Open to individual legal residents of the 50 United States or the District of Columbia who are the older of 18 years of age or the legal age of majority in their state of residence. One entry per person. Giveaway ends Friday, December 22, 2017 at 11:59 PM. One winner from all entrants will be randomly selected by Amazon who will notify that person via email. Watch your inbox since the winner will have 48 hours to respond. For more, please see the Official Rules at https://amzn.to/GArules. Ready to enter the Perfect Giveaway? Well, then, just click on this link: The Perfect Giveaway. May the Merriest Sassenach win!!!! And thank you for reading the blog! ***PLEASE NOTE: This prize will arrive after Christmas! *The reference to the 13th Lord of Lovat in the excerpt of the article by Marcus B. Simpson above appears to be a typographical error as it was the 11th Lord of Lovat (The Fox) who was the Jacobite leader. The 13th Lord of Lovat was not born until 1828 which would have been after the death of botanist, John Fraser. * Read more about the botanist, John Fraser, who discovered the Fraser fir here.